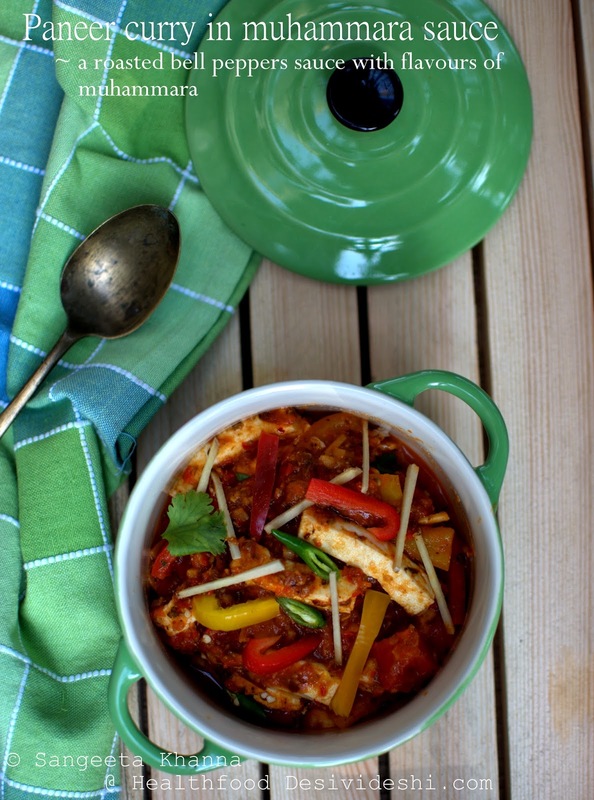 Paneer curries are Indian staples especially in vegetarian homes. And muhammara is one flavourful dip from mediterranian region that keeps calling my name. Red bell peppers and walnuts are some of my most favourite ingredients and I can use them in many variations. 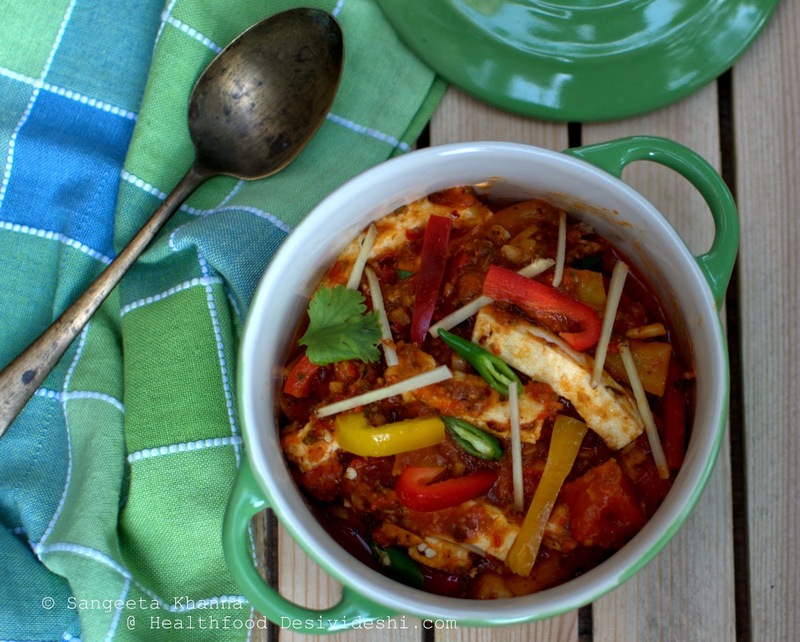 Paneer is a good protein source for everyday meals and can be made at home easily. One of the easiest fresh cheeses that can be made at home actually. I make my own fresh paneer whenever required but since we eat it so frequently and it is available so easily I sometimes get it from Mother Dairy booth for convenience. This time I did just that as I had little time left for cooking dinner and a roasted bell pepper mix that I made during winters was ready in the freezer. This curry got ready in 10 minutes and we both loved it with a multigrain roti on the side. The bell peppers are not very common in my kitchen as Arvind is intolerant to their smell, sometimes when I roast them in advance and mix really good flavourful tomatoes with them, he can have them. We have been getting really good bell peppers this winter and they were cheap too, that means they are being grown locally. I use them a lot for muhammara as Arvind can have that without a problem, roasting the bell peppers changes the aroma a bit and that is useful in my situation. 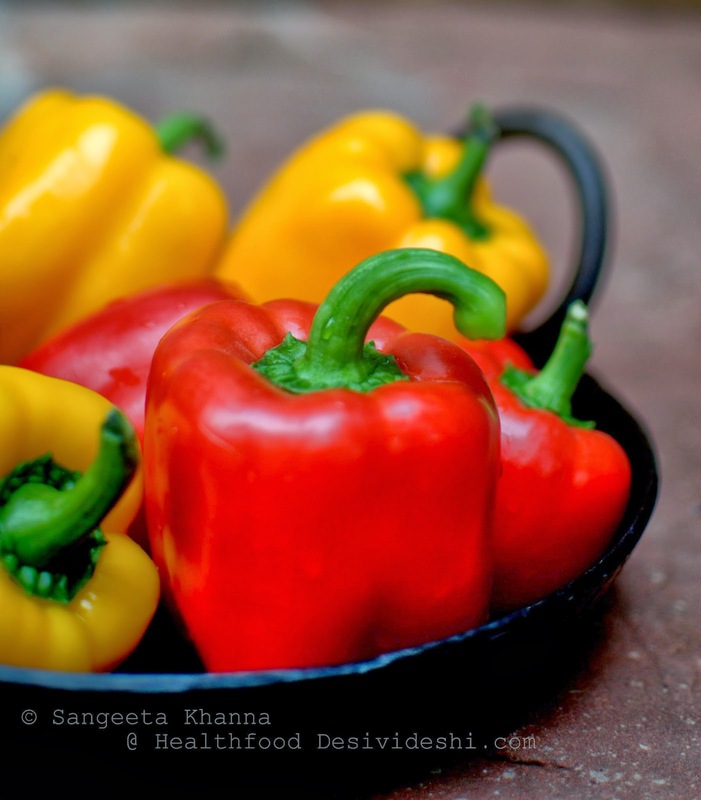 I make my soups and dips and even curries using roasted red or yellow bell peppers now. Green ones are stronger smelling and he can't have them in any form. I don't mind using just the coloured ones, good for me actually. More Carotenoids, more antioxidants, more anti inflammatory properties. Muhammara is made using either pan roasted or oven roasted bell peppers , I often roast them over gas flame too as it is quicker than the other methods. This time I had roasted them over gas flame and had froze them for later use. I tweaked the traditional muhammara recipe a little bit to make this curry, more because I wanted a curry that does not need much cooking. Yes I just dry roasted a few whole spices, ground them coarse along with walnuts and then pulped the roasted red bell peppers and tomatoes along with these to make the base for the curry. This curry base keeps well in the fridge or freezer, just add paneer cubes or strips and microwave till thoroughly heated, the curry is ready to eat. Dry roast the coriander seeds for a minute on medium flame and keep aside. Dry roast the cumin in the same pan till aromatic and nicely browned (but not burned) and keep it along with the coriander. Now dry roast the broken dry red chillies too for just a few seconds, mix with the cumin coriander, cool down a bit and transfer to the grinder. Make a coarse powder. Add the walnuts and make a coarse powder of all these. Peel the charred skin off the bell peppers tomato and garlic, chop roughly along with the roasted onion rings. Now add the roasted vegetables in a blender together and make a smooth puree. Mix the salt and roasted powdered spices and walnuts, blend till smooth. Adjust seasoning. This paste can be used immediately or can be frozen for about 2 months or refrigerated for 3-4 days. Add paneer strips to the above puree that is a spiced muhammara and microwave till the curry is well heated. The heating can be done in a pan, adding a little water of required. Serve hot with naan or roti, garnished with strips of bell peppers and coriander greens. Add ginger julienne liberally. Add sliced green chillies if you want some heat. This curry is a convenient and rich looking curry that uses no cooking fat. All the fat in the curry is from walnuts and paneer and we just love the way it tastes. I make it a meal by itself as I skip the breads most of the times but otherwise too you would want to eat more of the curry and less of the breads with this one. Bursting with flavours I would say. The spiced muhammara can be used as a dip if required. You can add cooked pasta to the sauce or can use it to make sandwiches or pita burgers, options are many and the recipe is simple. Add water to thin the sauce and simmer to make a flavourful soup served with a crusty garlic bread. You have a nice base for a curry, a dip or a soup at your disposal now. tempting curry....the capsicums looks so fresh! Please share your email id. I wanted to speak to you regarding a product review.